Abstract - This paper is dedicated to solving a problem of the realistic 3D-models rendering with a single FPGA chip. The suggested solution is based on the ray tracing algorithm with pre-processing of the input data by the BVH-tree and with the improved method of the background pixels separation. We regard sphere as the basic 3D-object. Correspondingly, we suggest an improvement method of computing ray/sphere intersection. Algorithm is optimized by reducing the amount of arithmetic operations to the minimum. Therefore, it can be implemented in a single FPGA chip. Furthermore, we suggest a specific method of spheres intersection handling. Software implementation of the suggested algorithm is used for testing and for handling possible errors. Abstract - One of the interesting applications of wireless sensor networks is the security systems. A network of sensors with a well-designed communication system can detect unauthorized intrusions to a defined area. In this paper we propose a network configuration based on the specifications of the nRF24L01+ transceiver module. The module has advanced power management technology providing long battery-dependent life while having a high transmission range compared to other modules like Bluetooth. Sensed information are relayed towards a base station with the help of router nodes. The empirical results align with our calculations in the sense of routing time and data transmission time. Abstract - Wireless Sensor Networks (WSNs) are used in many application areas. Their deployment should take into account their limited resources (energy, memory, computational capacity and storage). One of the objectives targeted by the deployment is data collection. However, the data collected contain a large amount of redundant information which yields to a large consumption of resources during the storage, processing and transmission. To remedy these constraints, we propose in this paper an approach to data compression and aggregation in WSNs called "BMRARI Distributed Ordering Compress" which is based on the "BMRARI Compress" coding (inspired from the Arithmetic, RLE, BWT and MTF coding). Abstract - The goal of every optimized network is end user’s satisfaction. As the increase of network performance allows the usage of more and more time and bandwidth critical applications such as VoIP and streaming, it is important to have a scalable network which support high data rate with reduced latency on both high and low mobility. The current wireless communication standards (GSM/EDGE and UMTS/HSPA) have problems of capacity, latency and low speed of data transfer, and these have led to poor quality of service (QoS) from the service providers and high customer complaints. LTE is the latest communication standard employed to increase the capacity and speed of wireless communication using a different radio interface together with core network improvements. 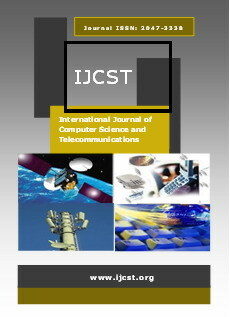 In this thesis, a test LTE network is built and experimentally evaluated against an existing UMTS networks in order to determine which of the technologies offer improvements in data rate, spectral efficiency, power consumption of the terminal, cell edge bit rate; and reductions in transmission latency, connection establishment latency and cost. It was deduced that LTE using orthogonal Frequency Division Multiplexing (OFDM) and scalable bandwidth, together with more advanced MIMO schemes, provides better data rates and improved overall KPIs than the UMTS. Abstract - Despite the recent progress in the development of ICT integration indices to support management of teaching in institutions, very little empirical research focusing on metrics for continuous improvement in ICT integration indexing of university information technology teaching professionals has been conducted. This situation exists despite the leadership role that university Information Technology Teaching Professionals and continuous improvement indexes can offer. The aim of this study was to fill this knowledge gap by proposing a metric model for indexing that can support continuous improvement of ICT integration. In particular the study reviews the concept of ICT and integration in the context of university teaching, catalytic role that University IT teaching professionals can provide in improving ICT integration and the emerging continuous improvement challenges. A review is then done on existing Metric based indexes and continuous improvement models. A conceptual framework based on continuous organizational learning model of knowledge based organization and theory of multiple methodologies and applied in extending Wan et al., (2009) ICT integration four levels model is then proposed. Based on the framework an index model for improving ICT integration is proposed. It is hoped that the designed metrics model can be applied to provide a basis for continuous improvement of Information Technology Professionals ICT current low levels of ICT integration. Abstract - Knowledge about the location of nodes is the main critical problem in Wireless Sensor Network. Awareness of the location of participating nodes is an important requirement in deciding the solutions for various issues related to WSNs. WSNs are used in many number of applications to perform the tasks such as target tracking, disaster relief, defence, environment monitoring, and many more. Localization of the node is required to report the origin of events, routing to answer questions, assist the group querying of sensors, on the network. Thus, one of the fundamental issues and problems in WSN is the localization of the sensor nodes. Thus this work provides the analysis of various proposed techniques for node localization and identification. The analysis is based on the merits and demerits of the techniques proposed and also the parameters used that project the performance of the system. In this analysis, the efficient localization techniques including LSWD, FRORF, PSO and ECM algorithms presented for WSN are studied and the performance of each technique is evaluated to determine the efficient localization identification technique. Comparisons are made on the results obtained from the evaluated techniques and it is proved that the distributed ECM provides better performance for the localization identification in WSN. The findings of the research also show that the distributed ECM method overcomes the problems of localization such as communication overhead, Computational cost, Energy Consumption, Localization error, Estimation error in WSN.